Watching your partner battle the ugly symptoms of depression can feel like a devastating and helpless experience. They can’t seem to get out of bed, are irritable, angry, unmotivated, and sad all the time. Where do you even begin? While you try to help in the ways you know how, you may feel like every attempt you make is met with rejection. As their partner you may feel obligated to take this on with them but aren’t sure what will help them best. You are not alone. So many people have partners currently going through depression and have no idea where to begin. Below are some tips that anyone can use to support their partner through the arduous battle we call depression. The term “understand” means to learn about their experience of depression and be able to empathize with them. Depression looks different for everyone, therefore, it is important to understand what they are going through. Are they sad, angry, or irritable? Having trouble sleeping? Experiencing lack of motivation? Are they experiencing loss of interest in things they used to enjoy? All of these are symptoms of depression and once you know these, it is easier to understand and empathize with them when they tell you how they are feeling. Sometimes we just need someone to listen. As difficult as this may be, it is important to not take your partner’s negativity personally. They may lash out, yell, snap, or push you away, but it isn’t intended to hurt you. Rather it is a reflection of the pain they are experiencing. You might even feel inclined to cheer them up with positive comments, but often this makes their pain feel invalid. Simply be present with your partner as they are experiencing these symptoms and try to externalize their negativity. It is the little things you do that will help your partner feel supported. Continue doing the things you enjoy together, create small goals for you both to accomplish, motivate your partner to engage in things that fill them up, and encourage them to seek help from a professional when things seem too heavy to take on their own. You are empowering your partner to get better by loving, supporting, and understanding them throughout it all. When it feels like you aren’t doing enough, you usually are. It can be easy to get wrapped up in making life more bearable for your partner that you lose sight of your own self care. Compassion fatigue is a real thing that can take a toll on you if you don’t stay on top of it. Make sure you continue to commit to your own mental, emotional, and physical self-care. Whether it is working out, your own therapy, alone time, or a night with friends, make sure you continue to engage in this support. Finally, if things related to your partner’s depression are impacting you, communicate that to them in a gentle manner. It will help you feel better and give them the opportunity to be there for you as well. 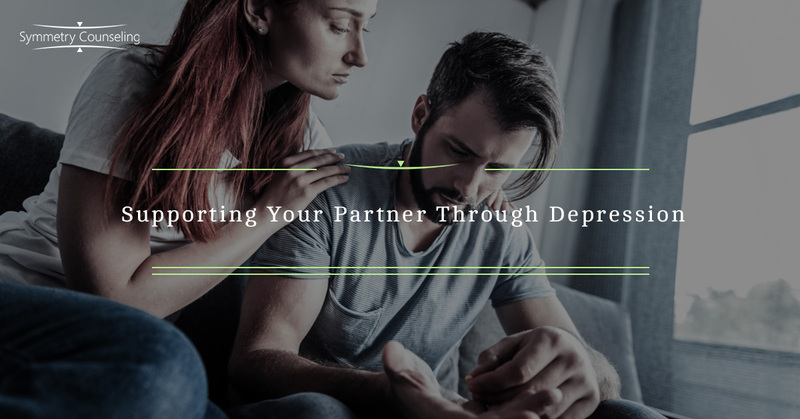 If you or your partner is currently experiencing symptoms of depression and you would like the support and skills to get through this difficult time, it may be useful to connect with a therapist. Contact Symmetry Counseling at 578-9990 to set up an appointment with one of our very skilled therapists today!